Image caption The dumped horse left the girl's grandmother "very shocked"
A grandmother was "very shocked" to find a horse in her back garden after her 13-year-old granddaughter ordered it from the internet. The teenager saw an advert online that said if nobody wanted the animal, it would be put to sleep, the RSPCA said. Giving her grandmother's address in Stoke-on-Trent, the horse was later left in her back garden. 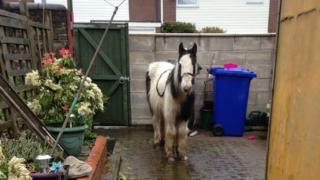 The animal welfare charity said the horse, named Mr Melvin Andrews, was underweight and covered in mites. Charlotte Melvin, from the charity, said a man dumped the horse at the house on Ford Green Road with "no words of advice" on 27 April, "leaving a very shocked nan". She said Mr Melvin Andrews "clearly was not treated well before being abandoned" and the previous owner has not been found. He is now in the care of horse charity, World Horse Welfare. The RSPCA has appealed for any information about Mr Melvin Andrews's previous home. The horse was named after Ms Melvin and World Horse Welfare field officer Rachel Andrews.